Peptide RTSDSRDHTRVDWKR(C), corresponding to amino acid residues 271-285 of rat GluR1 (Accession P19490). Extracellular, N-terminus. 1,2. Guinea pig Anti-GluR1 (GluA1) (extracellular) Antibody (#AGP-009), (1:200). 3,4. Guinea pig Anti-GluR1 (GluA1) (extracellular) Antibody, preincubated with the control peptide antigen. Immunohistochemical staining of perfusion-fixed frozen rat brain sections using Guinea pig Anti-GluR1 (GluA1) (extracellular) Antibody (#AGP-009), (1:400), followed by anti-rabbit-Cy2 antibody (green). 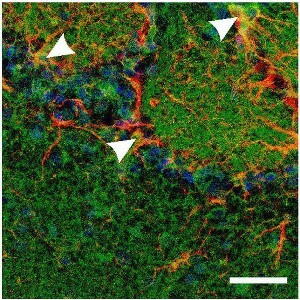 GluR1 staining appears in neuronal outlines (horizontal arrows) and in the inner molecular layer of the dentate gyrus (vertical arrow). Nuclei are stained with DAPI (blue). Cell surface detection of GluR1 and Vesicular GABA Transporter in human glioblastoma U-87 MG. Extracellular staining of live intact cells with Guinea pig Anti-GluR1 (GluA1) (extracellular) Antibody (#AGP-009), (1:25), followed by goat anti-guinea pig-AlexaFluor-488 secondary antibody (green). Cells were subsequently fixed, permeabilized and labeled with Anti-Vesicular GABA Transporter (VGAT) Antibody (#AGT-005), (1:200), followed by goat anti-rabbit-AlexaFluor-594 secondary antibody (red). Representative merged images of the double labeled cells are shown in A and B.
Sheng, M. et al. (2001) Cell. 105, 825. Song, I. et al. (2002) Trends. Neurosci. 25, 578. AMPA receptors are permeable to cations Na+, K+ and Ca2+. The Ca2+ permeability is dependent on the presence of AMPA2: whenever this subunit is present, the channel will be impermeable to Ca2+. The Ca2+ permeability of the AMPA2 subunit is determined by the presence of an arginine (R) at a critical site in the pore loop instead of a glutamine (Q) present in the same site in the other AMPA subunits. A post-transcriptional process known as RNA editing determines the presence of this R. Since most AMPA2 subunits in the adult brain have undergone RNA editing and most AMPA receptors contain the AMPA2 subunit, most native AMPA receptors will be impermeable to Ca2+. 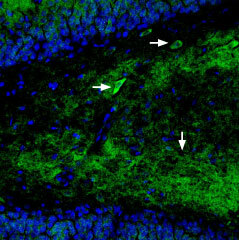 Expression of GluR1 in mouse olfactory bulb.Immunohistochemical staining of mouse olfactory bulb sections using Guinea pig Anti-GluR1 (GluA1) (extracellular) Antibody (#AGP-009). GluR1 staining (green) is detected in the glomerular and external plexiform layers (EPL), (right panel). GluR1 co-localizes with GFAP in periglomerular astrocytes and their processes in the neuropil (merged panel).Adapted from Droste, D. et al. (2017) Sci. Rep. 7, 44817. with permission of Nature Publishing Group. Alomone Labs is pleased to offer an antibody against an extracellular epitope the rat ionotropic glutamate receptor 1. Guinea pig Anti-GluR1 (GluA1) (extracellular) Antibody (#AGP-009) raised in guinea pig can be used in western blot, immunohistochemistry and immunocytochemistry applications. It has been designed to recognize GluR1 from human, mouse and rat samples. The antigen used to immunize guinea pigs is the same as Anti-GluR1 (GluA1) (extracellular) Antibody (#AGC-004) raised in rabbit. Our line of guinea pig antibodies enables more flexibility with our products such as immuno-colocalization studies, immunoprecipitation, etc. Mouse cerebellum and olfactory bulb sections (1:200). Droste, D. et al. (2017) Sci. Rep. 7, 44817. Anti-GluR1 (GluA1) (extracellular) Antibody (#AGC-004) for western blot analysis. GluR1 (GluA1) Overexpressed Membrane Fractions (#LX-103) are Xenopus oocyte membrane fractions overexpressing GluR1. GluR1 (GluA1) Antibody and Membrane Fractions Kit (#LK-103). This kit includes the GluR1 overexpressed membrane fractions and Anti-GluR1 (GluA1) (extracellular) Antibody (#AGC-004). Anti-GluR1 (GluA1) (extracellular)-ATTO-594 Antibody (#AGC-004-AR). A fluorescent labeled primary antibody. It can be used in colocalization studies in conjunction with any of our antibodies raised in rabbit. Anti-GluR1 (GluA1) (extracellular)-ATTO-594 Antibody (#AGC-004-AR). A fluorescent labeled primary antibody. This antibody recognizes an extracellular epitope and can be used to detect GluR1 in live cells.